The Patronage Act was wrong in the minds of many. Feeling ran high and events led to the Disruption on 18th May 1843 when more than 400 ministers walked out of the General Assembly in Edinburgh and marched to the Tanfield Hall to form the Free Church, thus making great sacrifices for what they thought was right. For they gave up their churches, their stipends, and their manses. Homeless thought they were, the faced the great task before them with courage and enthusiasm. Within four years the Free Church raised £1,254,00 and built 654 churches. Among those who marched to Tanfield Hall was the young minister of Peterculter Established Church, one Robert Thomson, 30 years old. At his last service in the Parish Church and now St. Peter's the building was crowded to the door. The young minister then left Church and Manse and the great majority of his people followed him. A list of the male members who 'came out' at that time contains the names not only of those resident in Peterculter alone but from neigh-bouring districts like Drumoak. The names of 228 males appear on this list and with their women-folk and families it would appear that the congregation numbered about 500. It must be borne in mind that in 1842 Culter consisted of a small community centred round the Burnside and Kennerty with Clovencraigs and Clayhills adjacent to the mill. Life was hard for the young minister. Out of church and home, he conducted open air services in different parts of his wide parish enjoying the simple hospitality of his people. A site for church, manse and school was found on the Contlaw hill and building commenced, much of the work being carried out by voluntary labour. Completed in 1844 it was one of the first of the Free Churches to be built and the cost was less than £400. It is interesting to note that the Free Church at Bucksburn was opened the same year, and on this occasion the young minister of Peterculter preached to a congregation of over 1000. There was still no manse and the young minister of such high promise lived in the only residence he could obtain-a damp unhealthy cottage and the privations he suffered were too much for him, and he passed away on 30th January, 1845. It was his wish to be buried at the door of his church at Contlaw, but 65 years later in 1909, when the church ceased to be a place of worship, his remains were re-interred in Peterculter Churchyard. His successor was Rev James Dalgarno who ministered for 40 years and also held the office of session clerk throughout those years. He was active in local affair~, being a member of the Parochial Board, which was responsible for the relief of the poor. The chairman was Rev John Allan, minister of the Parish church, while Dr William Lyon was Medical Officer. Mr John Smith, Inspector of Poor and collector of assessment was paid the princely sum of £15 per annum for his services. 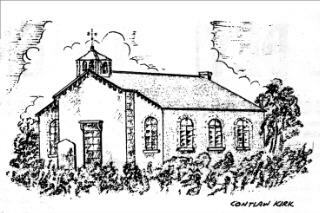 In 1856 it was recorded that while many members at the Disruption came from surrounding parishes, these were now provided with churches and the membership of Contlaw suffered. There was also emigration and removals of many of the longest farmers to other districts, their farms being occupied by members of the Established Church by the influence of the proprietors. Mr Thomas Morrice had the grocer's shop at Rocklands and this would be the cost of providing bags of biscuits for the tea. The 'Bus' could have been a Horse Brake hired to transport members from outlying parts of the parish. The annual accounts would be passed, and in these days of astronomical heating and lighting costs it is of interest to note one item for heating and lighting Contlaw Kirk one hundred years ago which reads, 'Coal, Paraffin and candles 16/ 11' .And that was for a whole year! ! An unfor tunate incident once occurred during the tea making in the boiler used for that purpose. One of the office bearers, using a candle to see if the water was boiling dropped the candle into the water. His friend comforted him by saying 'It disna maitter. It winna mak' ony difference to the tea. It was only a doupie onywye!”. About 1890 Culter was growing and many thought it advisable to build a new church in a more central situation. Not only was the Contlaw a considerable distance from the people but it was beginning to show signs of deterioration. As far back as 1882 plaster was beginning to fall and a plebiscite showed that the majority of the members were in favour of moving the church to the village. In 1891 John Kelman came to be minister and to him came the formidable task of building the new church.